On “A” day I have Journalism, Art IV, Speech, and World History. In Journalism the entire year will be spent creating the yearbook. Willa and I have been chosen as senior co-editors. I have already planned to seek ads from the Hub and Meeks Ford, the car dealership Hoke’s family owns in Farmington. Art IV is fine, if we could just get off “elements of design” and especially “The History of Art.” I won’t keep all those piles of artists straight. Speech is maybe the most fun class; I feel comfortable with everyone that’s taking it, which will help immensely in standing in front of them all. Mr. Beres is also a great teacher. I don’t think a lot of other like and his straight, no-nonsense, Charles Bronson demeanor, but I like that he pushes us and keeps us to a standard, with some interesting asides. I have already related for the class my crazy, cold wilderness ordeal for the Order of the Arrow (Boy Scouts, but kind of like their Special Forces, I guess). Everyone liked the wired, over-the-top nature of it. Now, World History is my favorite subject, but not my favorite class. Mr. Johnson is a mild-mannered, trim guy, but I think as a coach got stuck with the subject, as many are. He’s nice, but because of the way he teaches being too cut and dried, relying exclusively on whatever is in the book, I’m not sure about his actual background in the subject. “B” day is a bit harder than the humanities-heavy “A.” Against everything that is sane, I signed up for Trig. Heaven help me (curse you, college recs!). Next is Accounting, then “Media Experience,” and finally English IV. Accounting is kind of fun, in a sick kind of way–we’ve selected stocks and will be following them throughout the year. I say/write “Media Experience” like this because I wonder how much I will get from it. You see, the course consists of me being in the small media nook at the back of Mrs. Marks’ room while she teaches an English class in the front half. Mostly I view videos and then record its contents for her video library. That’s it. English IV however is neat. We have already read Beowulf and I am reading Shoeless Joe (the novel Field of Dreams is based upon) for my book report. Since beginning this eerie/dreamy novel I have been wondering what it would be like to be Shoeless Joe Jackson, and be stripped of what you love most. I don’t know if he accepted money, but I feel sure he did not help throw the 1919 World Series. Sometimes I also wonder about Archibald “Moonlight” Graham, and what it would be like to come so close to a dream. 1) The Seniors all eat together. 2) Semester Exams are optional now if you have a 87% or better for the semester. My next bit of news is something I’ll want to remember. Last Friday was the Hub of Entertainment’s opening night for the fall in tiny Edelstein in the northeast corner of Pearia County, there being no country dancing on weekends for the summer. Hoke and I continue to work as bar-boys as we did last spring, each of us assisting at our own bars across the wide dance hall from each other. He at the corner bar on the other side of the dance floor, and me at the horseshoe bar next to the entrance. Ainsley Lagerstein, who works there now as a waitress, was also there on Friday from near-by Princeville with a few friends. When she got there she made the short way through the crowds of weekend-cowboy-wannabe locals, shuffling amid the blasting of hit pop-country from the far stage as the smokey dance floor filled with line-dancers of various expertise. She came up to my bar to say hi as I was cut lemons and oranges for garnish. Then her group of four went over by the corner of a far wall. Soon the other three left and she looked bored. I went over and asked her how she was. I told her that when I was free, if she wanted, I could dance with her. Just not very well. It was the most shocked I’ve ever been. Out of the three times I’ve taken it, it was not even close to the best I’ve done. Oh well, I’m just happy to have it. It’s a nice picture too! 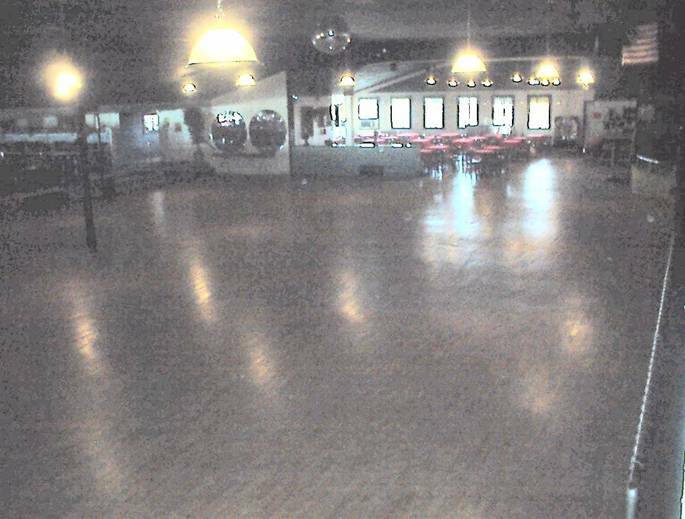 **The Hub Ballroom opened in 1938, and was a local institution. Several big names played on its stage, including Lawrence Welk, Glenn Miller, Jerry Lee Lewis, Guy Lombardo, Duke Ellington and Benny Goodman. Sadly, on June 24, 2009 the Hub was completely destroyed by fire.